The sandstone lodge is an old renovated farmhouse, built in the early 1900s, located at the entrance to the reserve. It has 3 rooms, with two doubles, 6 singles, 2 sleeper couches, and can sleep a total of 12. It has solar lighting and plugs, plus gas fridge, stove and geyser. The kitchen is fitted for self-catering guests, and a cook can also be arranged. The large covered porch with a great view of the mountains is an ideal spot to unwind. Chopped firewood is supplied for the outside braai area, as well as the lounge’s open fireplace. Also has a conference/dining room for mini meetings of up to 20 people, which can be catered for. Please note septic tank cannot take any foreign matter, so please respect this. Gas appliances should be used with care, especially the stove. Solar lighting and plugs – please follow directions on wall-mounted instructions in kitchen and lounge to prolong the life of the system. Local village shops have basic supplies if required. Catering can be arranged. 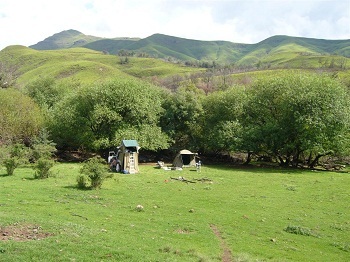 The Tweespruit bushcamp was launched in early Spring 2009. It has 4×4 or hiking, mountain bike or horseback access (from the main gateway lodge where vehicles can be safely left), with 4 vehicle sites next to the Jordan river, and a capacity of 20 people using own tents. It has a covered open plan boma with sink, tables, stone benches, overlooking campsite with great view of the mountains, making the bushcamp usable in all weather conditions. Also rustic gents and ladies ablutions with flush water and hot showers. The camp is a good base for hiking or mountain biking up into the catchment where high altitude wetlands are found, and for visiting the interesting and ancient volcanic basalt rock formations. 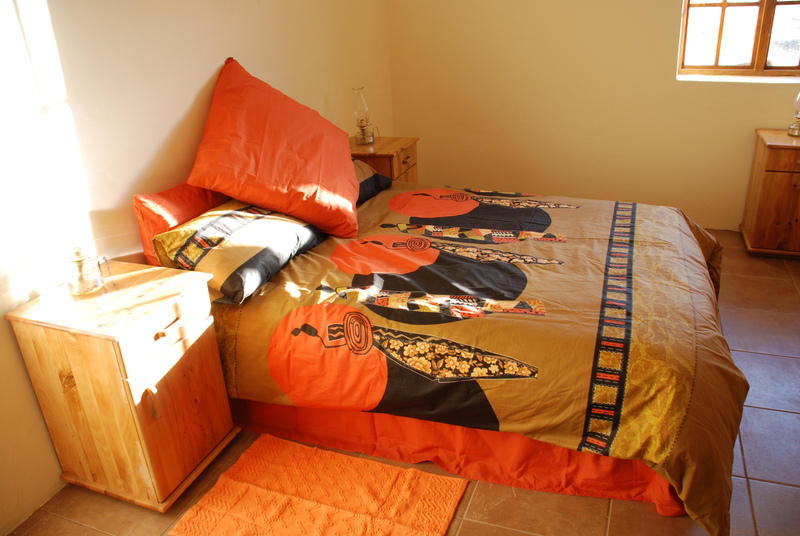 There is both lodge and camping accommodation to suite your budget and preferences.